The prorenin receptor (PRR) is highly expressed in podocytes, but its role in the maintenance of podocyte function is unknown. Here we generated podocyte-specific PRR-knockout mice and found that these animals died between 2 to 3 wk after birth. Within 14 d, PRR-knockout mice developed nephrotic syndrome, albuminuria with podocyte foot-process fusion, and cytoskeletal changes. Podocyte-specific PRR deletion also led to disturbed processing of multivesicular bodies and enrichment of autophagosomal (LC3) and lysosomal (LAMP2) markers, indicating a functional block in autophagosome-lysosome fusion and an overload of the proteasomal protein-degradation machinery. In vitro, PRR knockdown and pharmacologic blockade of vacuolar H+-ATPases, which associate with the PRR, increased vesicular pH, led to accumulation of LC3-positive and LAMP2-positive vesicles and altered the cytoskeleton. 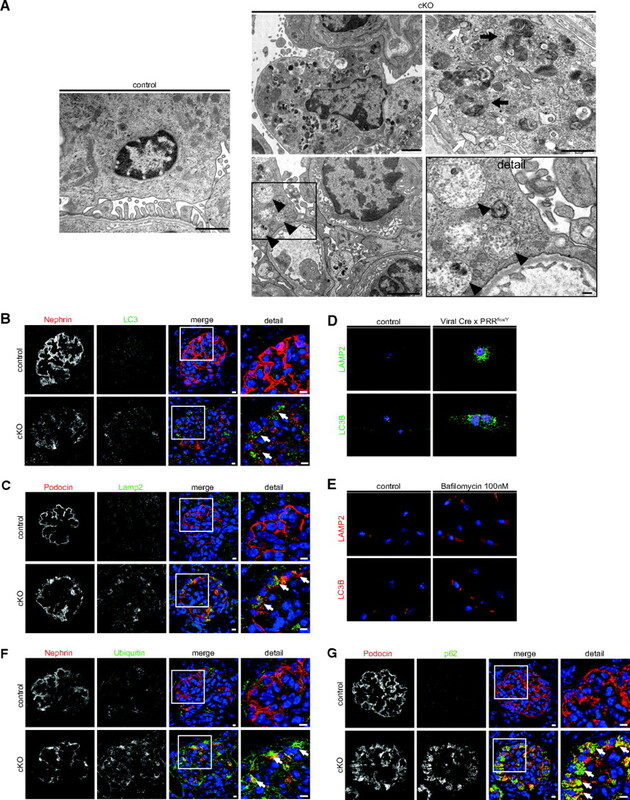 Taken together, these results suggest that the PRR is essential for podocyte function and survival by maintaining autophagy and protein-turnover machinery. Furthermore, PRR contributes to the control of lysosomal pH, which is important for podocyte survival and cytoskeletal integrity. Glomerular diseases lead to a progressive impairment of renal function and account for the majority of end-stage kidney diseases. Within the glomerulus, podocytes build a complex framework. They tightly envelope the glomerular capillaries with their foot processes and are responsible for maintaining the renal filtration barrier. Podocyte injury disrupts their actin cytoskeleton, leading to foot process effacement and molecular reorganization of the slit diaphragm accompanied by urinary protein loss.1 Moreover, recent studies indicate that podocyte damage is a key determinant of proteinuric glomerular diseases and the loss of podocytes predicts disease progression.2,3 However, the mechanisms responsible for podocyte maintenance and well-being are not yet fully elucidated. Initially, the PRR was reported to be a newly discovered renin-angiotensin system component.5 Hirose et al. demonstrated that PRR gene polymorphisms are associated with hypertension in Japanese men and suggested that PRR has a role in BP regulation.8 Ichihara et al. found that PRR blockade with a so-called handle-region peptide ameliorated cardiac and renal damage in several rodent models,9 although others were not able to confirm these findings.10 The specificity of the PRR-blocking peptide is also unclear. Several groups failed in their attempts to generate PRR-null mice, possibly because PRR-deficient embryonic stem cells do not form chimeras after blastocyst injection.6 Similarly, PRR inhibition by RNA interference or morpholinos in Caenorhabditis elegans11 and zebrafish12 yields embryos that die before the end of embryogenesis, indicating an essential, but still unknown, cellular function for PRR. The generation of conditional knockout mice circumvents the embryonic lethality and permits studying the pathophysiological role of PRR. Surprisingly, Ichihara et al. demonstrated that cardiomyocyte-specific PRR deletion resulted in early mortality due to disturbed cardiac tissue integrity,13 in sharp contrast to the organ-protective effect of the putative PRR-blocking handle region peptide.9 This finding suggests that the observed effects of PRR deletion were independent of the renin-angiotensin system. Remarkably, a 8.9-kD fragment of the PRR is associated with the vacuolar H+-ATPase (v-ATPase).14 These ATP-dependent proton pumps are involved in numerous cellular processes, including membrane trafficking, protein degradation, and coupled transport of small molecules.15 Interestingly, recent data suggest a functional correlation between the PRR and intravesicular acidification, leading to impaired Wnt signaling.16 The role of PRR in podocytes for maintaining renal function is not known. Here we demonstrate that podocyte-specific PRR inactivation leads to severe glomerular damage, renal failure, and death by the age of 3 wk. Our study also suggests that the PRR may be generally essential for protein turnover, cytoskeletal integrity, and autophagy homeostasis. Generation of conditional podocyte-specific knockout mice (cKO; Cre+/o x PRRflox/Y) is shown in detail in Supplemental Figure 1. Conditional KO mice were born at normal Mendelian frequencies. Inactivation of the PRR gene resulted in premature death of cKO mice between 2 to 3 wk after birth (Figure 1A). The cKO mice developed nephrotic syndrome with increased levels of serum creatinine, serum urea, and serum cholesterol, as well as decreased serum albumin measured by postnatal age day 14 (Figure 1B). Moreover, albuminuria occurred already at day 2 in cKO (Figure 1C), indicating severe filtration barrier impairment and podocyte damage. At day 14, albumin-creatinine ratio was dramatically increased in cKO (Figure 1C). Furthermore, neutrophil gelatinase-associated lipocalin (NGAL) and kidney injury molecule (Kim)-1 were 28-fold and 258-fold increased, respectively (Figure 1D). Histologic analysis at postnatal day 14 revealed massive protein enrichment in proximal tubular epithelial cells (Figure 1E), protein casts in tubules, tubular dilation (Figure 1F), and loss of brush borders (Figure 1G). Conditional PRR deletion (cKO) leads to congenital nephritic syndrome and acute kidney injury. (A) Kaplan-Meier survival curve of control (ctrl) and conditional knockout (cKO) animals (n = 12 control and n = 6 cKO mice were analyzed). (B) Serum creatinine at age day 14 was doubled, serum urea was tripled, serum albumin was decreased by 40%, while serum cholesterol was increased by 70% (n = 10 control and n = 5 cKO mice). (C) Urine SDS PAGE (Coomassie) shows marked albuminuria of cKO mice at age 2, 3, 5, 7, and 14 d (two μL of urine from each mouse and albumin standards were loaded). Urine albumin-to-creatinine ratio measured at day 14 was significantly increased in cKO animals. (D) Neutrophil gelatinase-associated lipocalin (NGAL) and kidney injury molecule-1 (Kim1) were markedly upregulated in cKO kidneys (E) Masson trichrome staining of kidney sections show tubular protein accumulation, (F) cast formation with tubular dilation, as well as (G) dilated tubules with flattened epithelium (Periodic Acid-Schiff stain; n = 10 control and n = 5 cKO mice). Magnification: ×20 in E and G; ×10 in F.
To further study the severe kidney damage observed, we performed closer analysis of renal glomeruli. 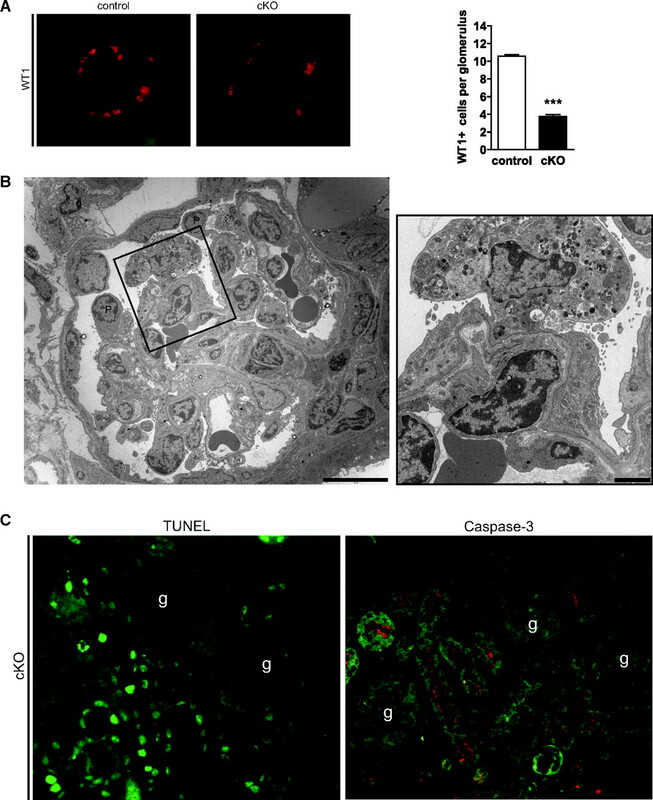 Histologic analyses at day 14 demonstrated that glomeruli from cKO mice showed PAS-positive enrichment indicating protein deposition in podocytes without major changes in glomerular mesangial expansion or glomerular vascular pathology (Figure 2A). Electron microscopy (EM) demonstrated that podocytes from cKO mice showed foot processes effacement (Figure 2B), a hallmark of glomerular injury leading to proteinuria.17 There were no major alterations of glomerular basement membrane diameter observed. The early onset proteinuria accompanied by podocyte foot process fusion prompted us to analyze podocyte-specific markers and cytoskeletal dynamics. In glomeruli from control mice, nephrin staining demonstrated a linear pattern along the glomerular basement membrane corresponding to its localization in the slit diaphragm. Glomeruli from cKO mice showed sharply reduced nephrin expression (Figure 2C). Synaptopodin is present in completely differentiated podocytes and modulates the actin-based shape and motility. Synaptopodin expression was also dramatically reduced in cKO glomeruli (Figure 2C). We next analyzed the expression of α-actinin, an actin-associated protein that links the slit diaphragm to the actin cytoskeleton. The distribution of α-actinin was significantly reduced in cKO glomeruli (Figure 2C). Actin-binding proteins regulate assembly and disassembly of actin filaments. Cofilin belongs to the ADF/cofilin family and has a 70% sequence homology to the actin-depolymerizing factor (ADF). Cofilin-1 is important for maintaining podocyte architecture.18 In its phosphorylated (inactive) state, cofilin-1 is not able to bind to actin, which consequently leads to impaired actin filament severing. In cKO glomeruli, we observed increased cofilin-1 phosphorylation, without distinct changes in total cofilin-1 (Figure 2D), indicating a regulatory influence of the PRR on cytoskeleton assembly and disassembly. PRR deletion leads to podocyte damage and cytoskeletal rearrangement by impairment of vesicular acidification. (A) Periodic Acid-Schiff stain shows glomuerlar protein accumulation (arrows). (B) EM shows normal epithelial cells and foot processes in control animals. cKO mice developed foot process fusion (c = capillary, p = podocyte). (C) Nephrin, synaptopodin, and α-actinin were absent or sharply reduced in cKO glomeruli. (D) Cofilin is an actin-binding protein. Its appearance is normal in cKO podocytes. However, its phosphorylation was markedly increased in cKO compared with control podocytes. (E) Cultured floxed podocytes treated with Cre recombinase adenoviral vector showed decreased PRR protein; increased vesicular pH, indicated by the decreased lysotracker signal; and altered cytoskeletal rearrangement, indicated by phalloidin staining compared with LacZ-treated controls. Lysotracker and phalloidin staining in red; nuclear Cre staining in green. (F) The same pattern occurred by treating control cells with the vacuolar ATPase inhibitor bafilomycin A1. Magnification: ×40 in A, C, and D; ×10 in E and F (Lysotracker); ×40 in E and F (Phalloidin). Insert shows a representative single cell. Scale bars: (B) 1 μm. The v-ATPase plays a pivotal role in the control of cellular and intracellular vesicle pH.15 Zebrafish embryo mutants that lack PRR/ATP6ap2 and v-ATPase subunits display similar phenotypes,12 suggesting a possible functional link between the proteins. Recently, the PRR was implicated in vesicular acidification.13 However, the role of v-ATPases for podocyte function and physiology is unknown. We speculated that dysregulation of vesicular pH in podocytes might lead to podocyte malfunction with abnormal cytoskeleton organization. We treated primarily isolated floxed podocytes with adenoviral Cre recombinase, resulting in decreased PRR protein expression (Figure 2E), and then studied pH and cytoskeleton alterations. As hypothesized, we found that Cre-positive podocytes showed increased vesicular pH, indicated by a loss of the Lysotracker signal, which subsequently resulted in an altered cytoskeleton arrangement and podocyte morphology (Figure 2E). To underscore the notion that pH alterations lead to rearrangements of actin cytoskeleton, we treated immortalized normal murine podocytes with the potent v-ATPase inhibitor, bafilomycin A1. As expected, v-ATPase inhibition also resulted in a loss of Lysotracker signal and morphologic changes that were similar to those observed in our PRR-inactivated podocytes (Figure 2F). These findings support the idea that the PRR is essential for v-ATPase function in podocytes and that disturbances in v-ATPase activity lead to cytoskeletal disruption. Besides changes in podocyte morphology, we discovered a massive loss of Wilms tumor (WT)-1 positive cells (Figure 3A) indicating podocyte cell death. Interestingly, EM showed cell destruction by cell lysis, with massive vacuole formation consistent with a nonapoptotic cell death (Figure 3B). Furthermore, our in vivo glomerular analysis did not identify TUNEL-positive cells or evidence of caspase-3 activation, whereas these markers were detectable in tubules of cKO (Figure 3C). Blocking of vesicular acidification with bafilomycin in cultured podocytes also resulted in enhanced cell death (Supplemental Figure 2), which could only marginally inhibited by a potent pan-caspase inhibitor q-VD-OPh.19 These observations support the conclusion that apoptosis was not the main mechanism leading to cell death induced by impaired vesicular acidification in our experiments. Our EM data, the lack of DNA fragmentation, and absent caspase activation in PRR-deficient podocytes, as well as in cells subjected to v-ATPase inhibition, all point to cell necrosis rather than apoptosis as the cause for podocyte loss. Deletion of PRR leads to podocyte cell death. 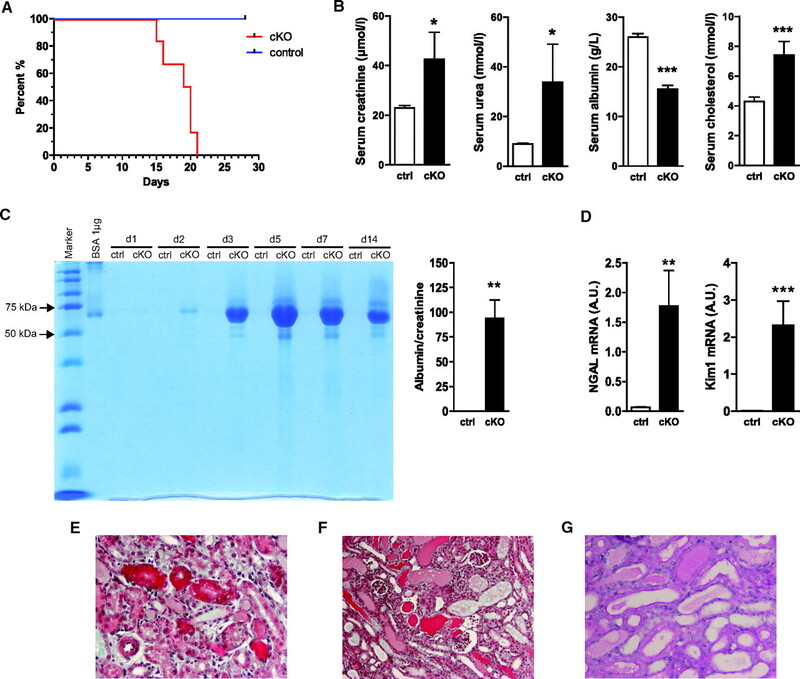 (A) In cKO glomeruli, the number of Wilms tumor protein (WT1)-positive nuclei was markedly reduced compared with control cells. (B) EM showed cKO podocyte (p = podocyte) cytolysis. (C) Immunofluorescence of cKO kidney sections showed massively enhanced DNA fragmentation, measured by TUNEL assay in tubular epithelial cells, whereas no fragmentation occurred in glomeruli (marked with “g”). Furthermore, staining for cleaved caspase-3 was only measurable in epithelial cells and not in glomeruli (n = 5 animals were analyzed). Magnification: ×40 in A and C. Scale bars: (B left) 10 μm; (B right) 2 μm. Autophagy is an essential cellular mechanism that has been shown to fulfill relevant functions for podocyte integrity and physiology.20 The digestion of proteins in this system is dependent on correct intravesical pH. We therefore investigated the influence of PRR deletion on autophagy. EM revealed extensive vacuolar degeneration of podocyte cell bodies with an accumulation of multivesicular bodies, lysosomes, and autophagolysosomes (Figure 4A). Many of the vacuoles consisted of expanded endoplasmic reticulum (ER) lumens (Figure 4A). Further analysis of glomeruli showed an enrichment of the autophagosomal marker LC3 (Figure 4B) and the lysosomal marker LAMP2 (Figure 4C) in podocytes of cKO, indicating a processing defect of autophagosomes and lysosomes. To further elucidate the causal role of PRR and v-ATPase activity on autophagy impairment, we inactivated primary floxed podocytes by adenoviral Cre recombinase and treated cultured murine podocytes with bafilomycin A1. In both cases, we showed excessive accumulation of LC3-positive and LAMP2-positive vesicles (Figure 4, D and E). In cKO glomeruli, we observed enhanced formation of ubiquitinated protein (Figure 4F) and a dramatic accumulation of p62/SQSTM1 (Figure 4G), an ubiquitin-binding scaffold protein. The accumulation of p62 in cKO particularly suggests an abnormal accumulation of toxic proteins and organelles, which might overwhelm any compensatory attempt of the proteasome degradation pathway to counter-regulate the podocyte disturbance. A mechanism to compensate for damaged protein overload is endoplasmic reticulum (ER) stress, which might have led to irreversible podocyte injury and loss. This state-of-affairs distinguishes podocytes from other renal cells that are able to proliferate. We found that in PPR-deficient podocytes, dilated ER lumens stained positive for calnexin indicating increased ER stress (Figure 5A), which was confirmed by the increased detection of the ER stress marker GRP78 (Figure 5B). Conditional PRR deletion (cKO) impairs autophagy and protein degradation by inhibiting vesicular acidification. (A) EM shows healthy podocytes and foot processes. EM of 14-d cKO mouse podocytes shows massive vacuolar accumulation with multivesicular bodies (black arrowheads), rough ER (white arrows), and lysosomes (black arrows). Immunofluorescence shows accumulation of (B) autophagy marker LC3B and (C) the lysosomal marker LAMP2 in cKO podocytes (arrows indicate positively stained podocytes). (D) In vitro, treatment of PRR floxed podocytes for 6 d with Cre recombinase adenoviral vector led to accumulation of LC3B- and LAMP2-positive structures; controls were treated with adenoviral LacZ (n = 3 independent experiments). Cre positivity was confirmed by costaining (red signal) with an appropriate antibody. (E) Similar results were obtained by treatment of murine podocytes with bafilomycin A1 or vehicle (DMSO) for 48 h at the indicated concentration. (F) Ubiquitin and (G) the autophagy adaptor protein p62 were strongly upregulated in cKO podocytes. Scale bars: 100nm (A, detail) 1 μM (A, any others); 5μm (B, C, F, G). Magnification: ×40 in D; ×20 in E.
PRR deletion leads to increased ER stress in podocytes. At day 14 postnatal, cKO podocytes showed increased staining for (A) the ER marker calnexin and (B) GRP78 (arrows indicate podocytes stained positive for GRP78). Scale bars: 5 μm. We provide the first evidence that podocyte-specific PRR knockout mice develop congenital nephrotic syndrome and begin to die at day 14. We could show that the PRR is essential for podocyte survival by maintaining the protein turnover machinery, indicating a functional relationship between the PRR, vacuolar acidification, and the malfunction of autophagy. Podocyte-specific deletion of the PRR impairs vesicular acidification, leading to an abnormal cytoskeleton organization as well as impaired lysosomal processing, defective autophagocytosis with the generation of dysfunctional autophagolysosomes—as supported by p62 accumulation—ER stress, and impaired multivesicular body disposition. In our study, we found that cKO animals develop proteinuria, which is correlated with massive foot process effacement. These results support a functional link between PRR deletion and cytoskeleton alterations, which may be related to impaired v-ATPase function. Supporting this notion is the recent finding that v-ATPase subunit C binds to and induces cross-linking of actin filaments.22 Furthermore, cofilin-1 deficient mice show persistent proteinuria and impaired podocyte architecture.18 Podocytes are highly differentiated cells with a very complex cellular architecture, resembling that found in neurons.23 The PRR is also highly expressed in the nervous system.5 Interestingly, the first description of the PRR in human disease did not involve its role in the renin-angiotensin system but demonstrated an exon-4 splice mutation in the PRR gene that was linked to mental retardation.24 A growing body of evidence, largely from neurodegenerative diseases, supports a link between cellular transport defects and altered actin cytoskeletal organization.25 Moreover, phosphorylation (inactivation) of cofilin in hippocampal neurons leads to dystrophic morphologic changes, as well as to cell death, and appears to be a potential mechanism of neuronal dystrophy in Alzheimer's disease.26 Thus, it is tempting to speculate that cofilin in podocytes could also be, at least in part, responsible for cytoskeleton rearrangements and foot process effacement, due to its enhanced phosphorylation/inactivation. Furthermore, our results may go beyond the demonstration of a link between impaired autophagy, cytoskeleton dysfunction, and podocyte cell death. Lee et al. recently demonstrated that Alzheimer's-disease-related protein presenilin-1 is essential for v-ATPase targeting to lysosomes, lysosome acidification, and proteolysis during autophagy. Presenilin-1 mutations lead to pathogenic protein accumulation and neuronal cell death.30 In our study, we were not able to elucidate the precise mechanism involved in how the PRR affects v-ATPase function. Nevertheless, we speculate that the PRR could be involved in the trafficking of v-ATPase to lysosomes, and therefore for lysosome acidification and proteolysis during autophagy. We propose a new model of podocyte survival and protection, where the PRR affects intravesicular acidification and protects cells against disturbed protein degradation or protein turnover due to impaired autophagy. We suggest that PPR deficiency leads to intensified ER stress, massive accumulation of unprocessed proteins, and finally, podocyte death. We observed features similar to those found in neurodegenerative diseases or with advanced aging. Our findings underscore the importance of the PRR in maintaining intravesicular acidification and, most likely, v-ATPase function in developing podocytes. Impaired v-ATPase function leads to impaired autophagy and podocyte death. Together with the findings by Hartleben and colleagues,20 our results suggest that impaired protein degradation is an important pathologic process in podocytes. Female mice, in which loxP sites flanked exon 2 of the PRR/ATP6ap2 loxP gene, were bred with male mice expressing the Cre recombinase under control of the podocin promoter. Since the PRR gene is located on the X chromosome, the resulting male Cre+/o x PRRflox/Y mice (Supplemental Figure 1) represent homozygous podocyte-specific PRR knockout mice (cKO). Male Cre+/o littermates (control) were used to exclude the possibility that Cre-mediated effects were responsible for phenotypic differences. All mice were from a pure C57BL/6 background. Local authorities approved the studies and American Physiologic Society guidelines for animal care were followed. See supplemental online data for detailed protocols on genotyping procedures, measurement of serum parameters, Western blotting, immunofluorescence, and real-time PCR analysis. Small pieces of the renal cortex were fixed with 4% formaldehyde/2.5% glutaraldehyde in 0.1 M cacodylate buffer for 3 d. Samples were stained with 1% OsO4 for 2h, dehydrated in a graded ethanol series and propylene oxide, and embedded in Poly/BedR 812 (Polysciences, Inc., Eppelheim, Germany). Ultrathin sections were contrasted with uranyl acetate and lead citrate, and examined with a FEI Morgagni electron microscope. Digital images were taken with a Morada CCD camera and the iTEM software (Olympus Soft Imaging Solutions GmbH, Münster, Germany). Glomerular isolation and primary cell culture were performed as described previously.31,32 Briefly, mice were anesthetized, the kidneys were perfused initially with ice-cold PBS via the abdominal aorta, and afterwards with Dynabeads (diameter 4.5 μm; Invitrogen, Karlsruhe, Germany). Kidneys were removed, minced, and digested with collagenase A (Roche, Grenzach, Germany). Digested kidney tissue was further sieved through a 100-μm cell mesh with intermittent PBS. Using a magnet catcher and a subsequent washing procedure, the Dynabead-containing glomeruli were purified until an approximate purity of 95% determined microscopically (Zeiss Axiovert, Germany) was achieved. Glomeruli were transferred into a collagen I-coated T75 cell culture flask and cultured in primary cell culture medium for 4 to 5 d (37 °C, 5% CO2) until glomeruli were surrounded by a small halo of primary cells. In passage one, glomeruli and cells were trypsinized (0.05% trypsin, 0.02% EDTA in PBS), and glomeruli containing magnetic particles and excessive magnetic particles were removed via magnet catcher. Cells were centrifuged at 1100 RPM for 5 min to remove excessive trypsin, and primary cells were transferred to a collagen I-coated T75 cell culture flask with primary cell culture medium. Percentage of primary podocyte cells was approximately 80% (confirmed microscopically). With each passage, primary cells were transferred to a collagen I-coated T75 cell culture flask with primary cell culture medium. Cells were split once confluence reached approximately 70%. Passage 3 of each primary podocyte cell line (PRRflox/Y or WT) was used for viral transduction (for details, please see the supplemental data). Dr. Peter Mundel (Harvard University, Boston, Massachusetts) generously provided immortalized murine podocytes. Immortalized murine podocyte were cultured as described.33 Briefly, podocytes were grown under permissive temperature in the presence of IFN-γ 10 U per ml on type I collagen. To induce differentiation, the cells were maintained at 37 °C without IFN-γ for 10 to 14 d.
Data are presented as means ± SEM. Statistically significant differences in mean values were tested by two-tailed t tests. A value of P < 0.05 was considered statistically significant (*P < 0.05, **P < 0.01, ***P < 0.001). We thank Petra Berkefeld, Blanka Duvnjak, Ilona Kamer, May-Britt Köhler, Jutta Meisel, and Astrid Schiche for their excellent technical assistance. The Deutsche Forschungsgemeinschaft (MU1467/3 to 1), the Novartis Foundation, and the Excellence Initiative of the German Federal and State Governments (EXC 294 to TBH) all supported this work. The authors are not aware of interest conflicts. F.R. and I.Q. contributed equally to this work. See related editorial, “The Prorenin Receptor: What's in a Name,” on pages 2141–2143. WormBase web site, http://www.wormbase.org, release WS206, October 4, 2009.